During Amrut Manthan a vessel full of Amrut emerged from the sea .The amrut had the power to make the person immortal therefore there was an argument between the devils & deities for the amrut & both insisted that they will drink the amrut first . In order to prevent devils from drinking the amrut , Lord Vishnu in the guise of extremely beautiful women appeared & suggested that she will distribute the amrut among both without any partiality . Other deities recognized that she is incarnation of Lord Vishnu however the devils fail to recognize that they were deceived by Lord Vishnu as they were completely impressed with the most beautiful lady ...........Mohini. 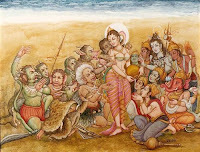 She took the advantage of the situation & distributed the amrut among Gods . If Gods & devils are so influenced by beauty of women than what will be the plight of an ordinary man on seeing a gorgeous woman ? POVERTY is root of misfortunes is not said in vain .Millions of people through out the world suffer due to poverty. At times parents , relatives & friends leave the person all alone to fight with destiny when a person gets trapped in the clutches of poverty.You will also agree what I have said above after reading the following. This is photograph of 8 years old Gao An-ni, who is from a village of China . An-ni is suffering from a tumor in her under lip. She was born with the under lip tumor. His father took her to a hospital in 2007 but after coming across the cost of operation , he took her back to home as he could not afford her medical treatment & now An-ni is fighting with her destiny all alone. This is photograph of 29 years old Chen Congfa, also known as MONKEY MAN .Chen who weighs 20 Kgs is from China. He was born with the facial deformity . As his poor parents cannot manage money for Chen's treatment , Chen is living on God's mercy . In a nut shell Poverty is deadly enemy of man. Unfortunately many people still believe in blind faiths although living in 21st Century. These people are responsible for evil practices like child sacrifice , female infanticide etc in our society . Illiteracy , greed , lust make people easily believe in blind faiths. In recent past an elderly woman from Ahmadabad had put her 3 years old grand daughter to death in the hope that her death will bring wealth & birth of male child in the family. The lady was told by a practitioner of black magic that , if she wants wealth & male child in her family she must kill her 3 years old innocent grand daughter . The old lady believed in the tantrik's words & plotted her own grand daughter's death . One day she took her on the top of her house & than threw her in the water tank . For 3 days the girls parents searched their daughter but they were unsuccessful. On the fourth day one of the girl's aunt went on the top of the house to check that why the taste of water has changed suddenly ..... she was surprised to see , the girl's dead body floating in the tank & was unable to bear the offensive smell of the dead body . The child's parents were in tears but they felt that it was not a natural death of their daughter . So they lodged a police complaint in the local police station in Ahmadabad. The police stared their work & suspected that there was some one from within the family who has done this criminal offense .The Police efforts did not go in vain & finally caught the culprit . The whole family was shocked to know that the child was put to death by her own grand mother for wealth & male child . When the old lady was interrogated , she mentioned about the tantrik who had suggested her to do this offense. The police arrested both , the old lady & tantrik . The news made me realize that people are still salves of blind faiths even in the 21st century.whole news was telecasted on a popular news channel few months ago . Another funny but true news was of a man who married a female dog to atone for sin . According to the news paper , 33 years old Selvakumar married a female dog because he had killed some 15 years ago two dogs & immediately after killing his body was paralyzed . An astrologer therefore suggested him to marry a female dog to get rid of the sin which he has made by killing the dogs. 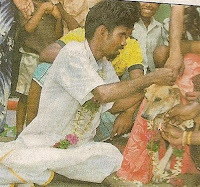 On 12th November 2007 , Salvekumar tied a knot with the female dog in Ganesh temple . The dog was dressed in sari & according to Hindu Vedic system they got married. Selvakumar even tied a mangalsutra in the female dog's neck & he named her Selvi. After the wedding the relatives of Selva Kumar had lunch . Selvakumar has promised to take the care of the female dog through out his life. On reading this news I simply felt like laughing because by just getting married with a dog one I can get rid of his sin of killing dogs than all murders who kill so many people will get rid of their sins by getting married to many women. What do you say ? Thus according to me blind faiths are root of malpractices in our society. On one sunny afternoon suddenly several flying saucers making horrible noise covered the sky & I saw aliens dressed in white robes flying in sky ...because of the vibrations all the trees were shaking , birds started chirping loudly & there was a big commotion. People were screaming at the top of their voice , babies were crying & the whole situation was pathetic. I ran towards the window to close it but I was unable to do so because every thing started moving similar to that in Earth quake & than one Alien who was flying in the sky came closer to me & said ," we are here to destroy the ' BAD ' & so I am throwing this apple if you are able to catch it you will survive ". He threw the apple & before I able to catch it I realized it was a DREAM.Although it was a dream which I saw few years back but that dream forced me to know about the EXTRATERRESTRIAL LIVING BEINGS. Do Aliens exist ? is a big question today but after gathering information on Aliens I strongly believe that Aliens do exist & it is might possible that they are among us .There are people who have personal experiences with Aliens for instance Mrs. Betty Andreasson & her family had a personal experience with 5 Aliens at her residence in South Ashburnhum , Massachusetts on 25th January 1967 . 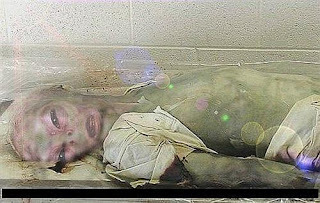 According to her 5 Aliens came to her house in night they had worn blue colored cloak ,had 3 fingers in each hand , they had slit instead of mouth wide eyes .Mrs. 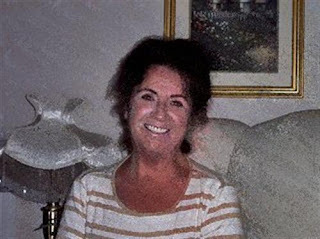 Andreasson said that the Aliens took her in their space craft & there they conducted some tests on her which she cannot remember as she was hypnotized by Aliens & than she was sent back to her house after 4 hours Since 1967 the Researchers &Psychiatrist are unable to complete their investigation on Mrs. Andreasson's experience with Aliens. Since I strongly believe in the existence of Aliens.Individual experience of people from all over the world with Aliens further encouraged me to know more about these mysterious living beings & luckily I came across UFO FESTIVAL (Unidentified Flying Objects ) at Roswell in Mexico .The festival is celebrated in remembrance of 4th July 1947 incident. On 4th July 1947 in night an alien space ship crash-landed in Roswell, New Mexico.A rancher claimed that wreckage is made of unusual metal The United States military collected the wreckage and at first announced that it was indeed from a flying saucer. However, soon after, military officials insisted that a mistake had been made, and that the wreckage was from a weather balloon.This revised statement sparked immediate controversy. 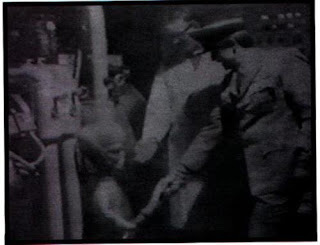 According to the natives of Roswell the debris was not of weather balloon but was of Flying saucer.They believed that the government had conspired in order to hide the presence of extraterrestrial life.The photograph will reveal that it was an Alien Saucer & the locals of Roswell were correct , as one can see Alien shaking hands . The mystery of Roswell Incident is still unsolved , the debate continues till now .However in 1991 Roswell UFO Museum & Research center was built & it is a place where one can find facts related to Roswell Incident & other UFOs( Unidentified Flying Objects ).The UFO enthusiasts should visit the Roswell Museum to satisfy their quench for knowledge about Aliens. Flying Objects During the UFO Festival ,Alien Parades , Concerts ,Music shows & other events are carried out also in Shops toys of Aliens are available .The whole festival is very lively. pilots, crew members and a bunch of other people at the Chicago O'Hare Airport in November, 2006. The whole story was shown on CNN January 6, 2007 this incident was also covered up for unknown reason.